Late work . . . it is on the top 10 list of teacher frustrations, right? After teaching in different districts in different states, I have found there is no universal policy when it comes to late work. My late work policy is one of those things that kept evolving the longer I taught. When I first began teaching I was very legalistic. If a student was absent two days, he or she had two days to make up the missing assignments when he or she returned to school. I then tried extending it to one week to make up the missing work before the assignment became a zero. Many times I caught myself telling the parent that I was “preparing the child for life” when the parent took issue with my policy. But, then I had an epiphany when I really thought about the “preparing a child for life” statement. What are the due dates that adults have? Paying bills is a big one! I can turn in my taxes and electric bills late. Granted there is a penalty involved, but the IRS and the electric company are still happy to take my money. There is even a grace period with most companies that allows you to pay your bill after the due date without a penalty. But, by the same token, there is a line in the sand when the IRS says you have to pay or go to jail and the electric company says you have to pay or we’ll turn off your electricity. So, if I took this same “preparing for life” outlook and applied it to school, what would it look like? I decided that all work must be turned in before the last week of the grading period. That is my line in the sand. Beginning on Monday of the last week of the grading period, all missing assignments are marked as zeros. The next part is a little tricky. What type of penalties should be given for late work? If a student is absent, he or she should be given a week to make up missing work without a penalty. I decided to dock all other missing assignment 10%. I didn’t feel like the student deserved full credit for the work, but if the penalty is too severe the student won’t be motivated to do the work. Students who have trouble turning in their work are usually either disengaged with school or they lack organizational skills. Do I really want to make the student hate school even more by being legalistic? I want them to complete the work and hopefully learn something in the process. Another thing you can do that is like real life is to have an amnesty day. Even the IRS has an Amnesty Day. You can approach this two different ways. Approach #1: Don’t announce it ahead of time. This is kind of like a pop quiz. One day announce that today is “Amnesty Day”. Students are given class time to work on missing assignments. Work turned in on that day will not be given the 10% penalty. Here’s the best part! Students who don’t have any missing assignments are given free choice as their reward. They can work on computers, read a book, centers, etc. Approach #2: Announce ahead of time that ___ day is going to be Amnesty Day so students can work on missing assignments at home. All missing assignments turned in on Amnesty Day won’t receive the 10% penalty. Students who have cleared all of their missing assignments will get to participate in free choice. I’m sure you will have some motivated little workers with this approach! 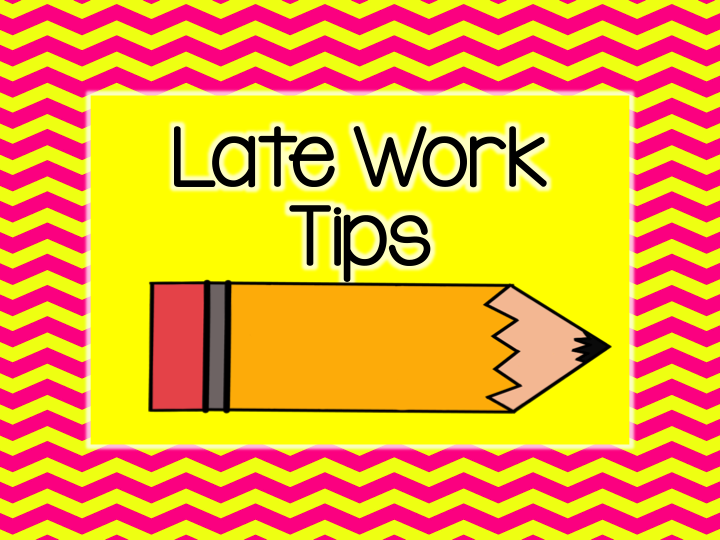 Check out my Late Workitis for more ideas for dealing with late work.